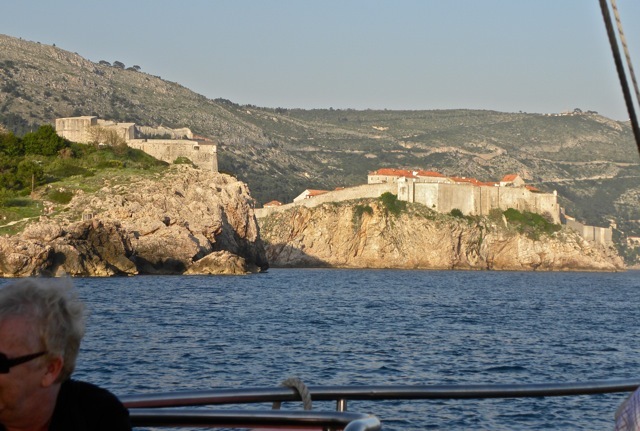 On our recent tour of the Balkans, we rode along most of the Dalmatian coast. This coast on the eastern shores of Adriatic Sea is dotted with thousands of islands, snuffing out sea waves. The sea water was as calm as lake water. As a key sea lane for Europe-Asia trade, this coast was a battlefield for centuries. Castles were built to protect kingdoms and to control trade routes. 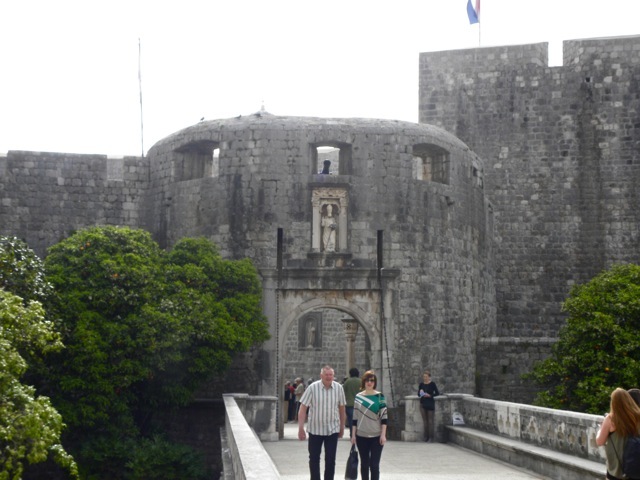 We visited several medieval castles along the coast. 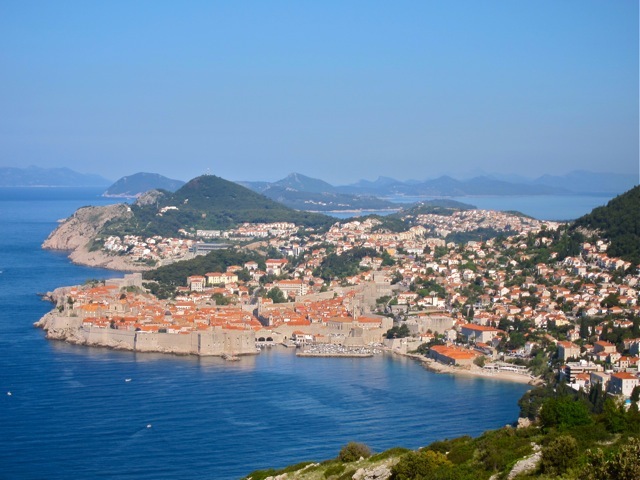 The most beautiful castle was Dubrovnik at the southern tip of Croatia. This city state was a powerful maritime power and vied for supremacy with Venice. It is protected by a formidable wall. The city behind thick walls high above sea cliffs must have been a source of despair to any invading fleet. The approach on land is just as forbidding. Ships were repaired in these arched ship yards in the harbor outside of the city wall. 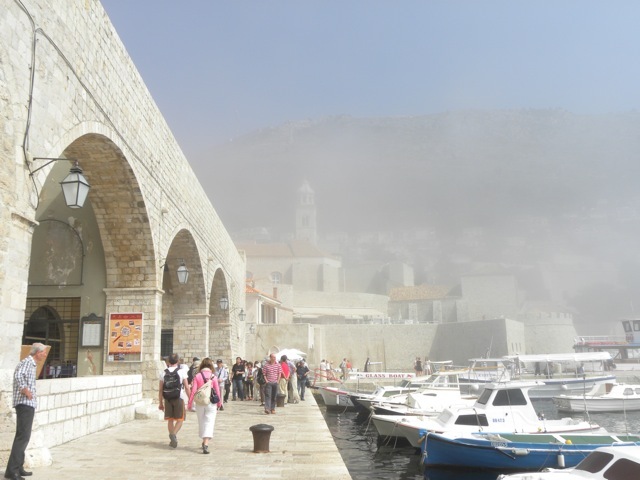 The ship yards have become cafes now, and the harbor was shrouded in thick fog during our visit. 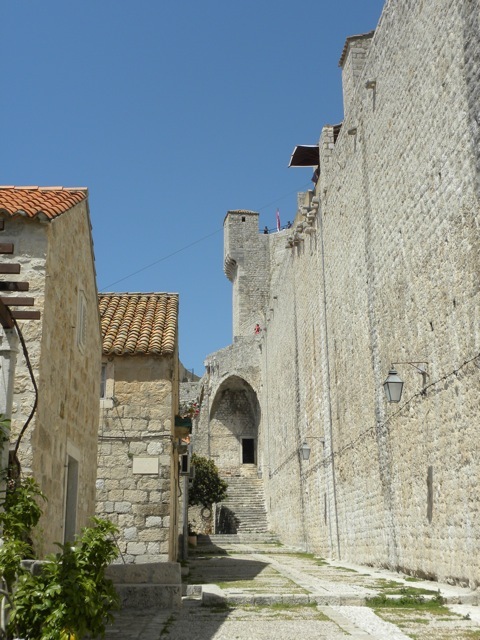 Homes were built to the inner edge of the high city wall. Residences and stores are crowded tightly against one another. 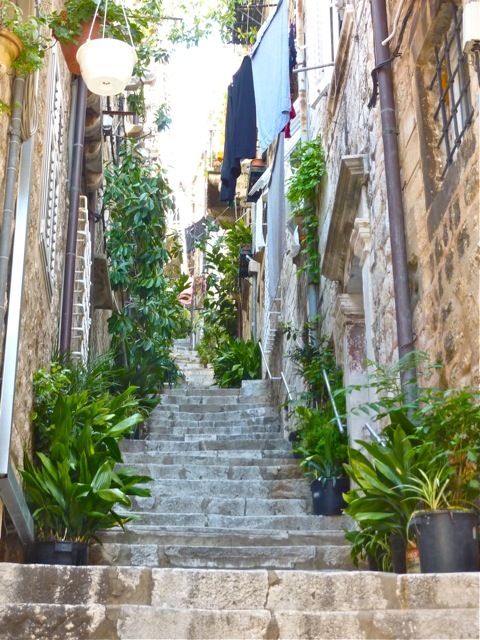 Romantic alleys climb up the slopes, flanked by houses with drying laundry. 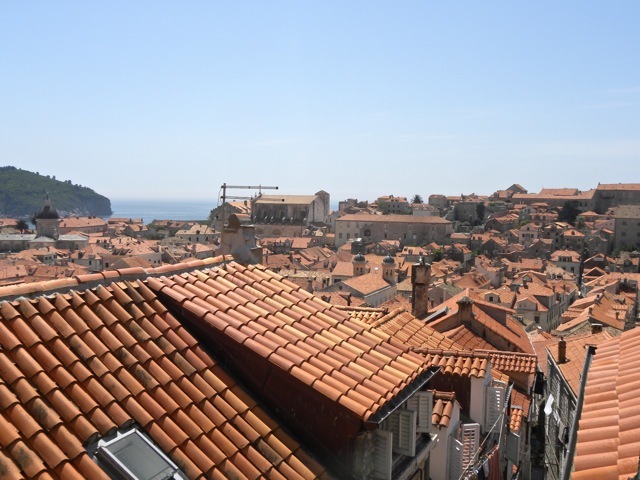 The roofs of Dubrovnik are built with red tiles, rendering the city warm and charming. 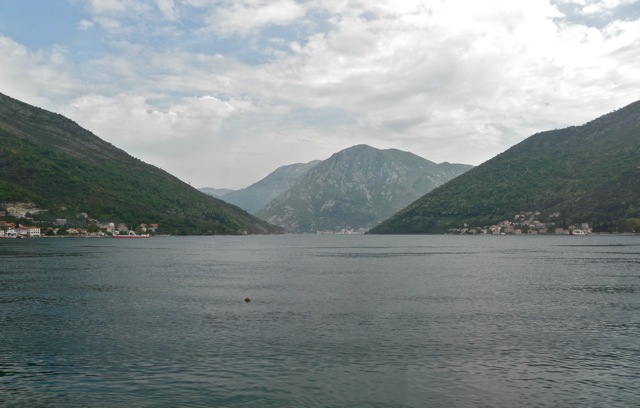 Montenegro is an old country that borders on Croatia. 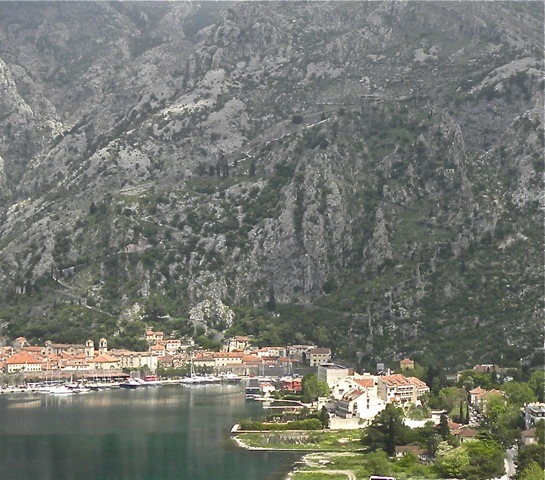 Its Bay of Kotor is Europe’s southernmost fjord, with steep mountains ringing its shores. 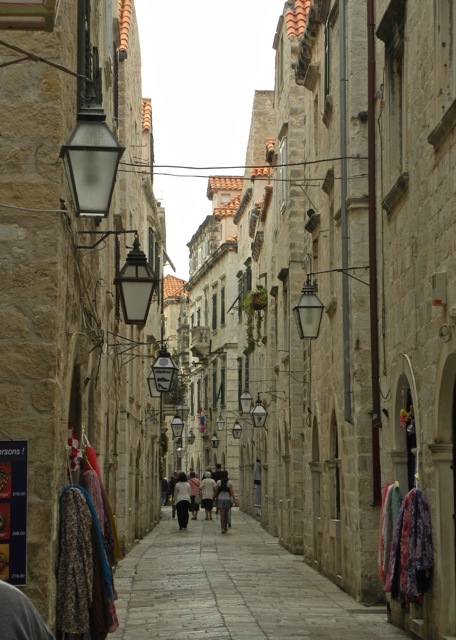 At one point, it is only 100 meters wide, and Venetians rigged a chain across it to keep out hostile ships. 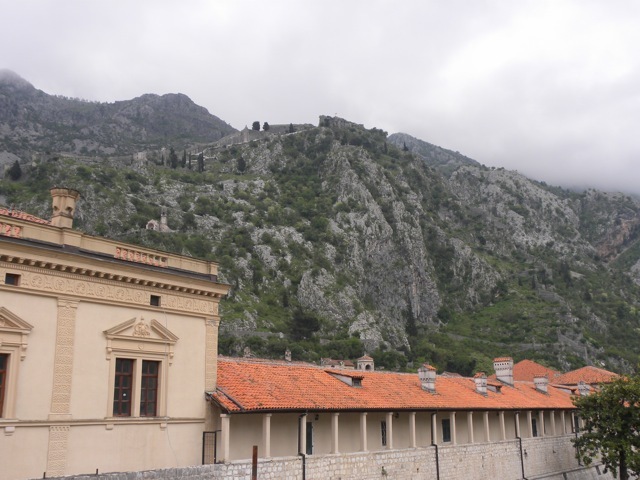 The medieval town of Kotor is protected by a 3-mile wall that climb up the mountain to a commanding peak. I was fascinated by the defense potential of this mountain-climbing wall. A chapel sits below the castle on the peak. Several hundred feet above Kotor sits the castle at the peak (upper right corner of picture), one wall that zigzags vertically up the mountain (right edge of picture), and the other leg of the wall zigzags down (diagonal from upper right to lower left). The photo is cluttered with noise and the walls may be difficult to discern, but it was really impressive to see. 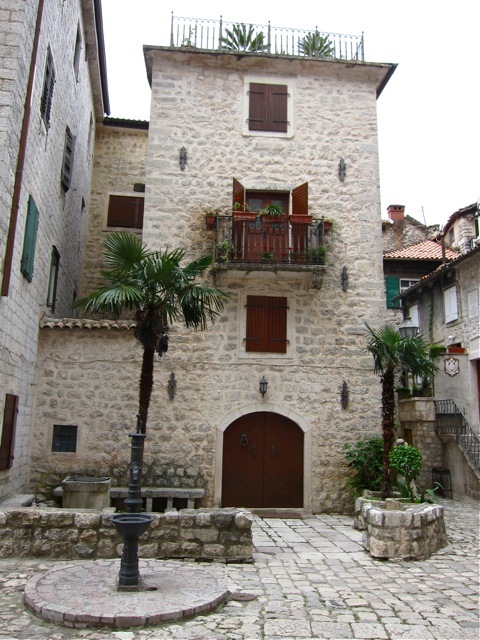 Houses in Kotor are built in Venetian style due to its centuries-long occupation by Venice. While riding on the Dalmatian coast, we saw a wall built along a hill side. 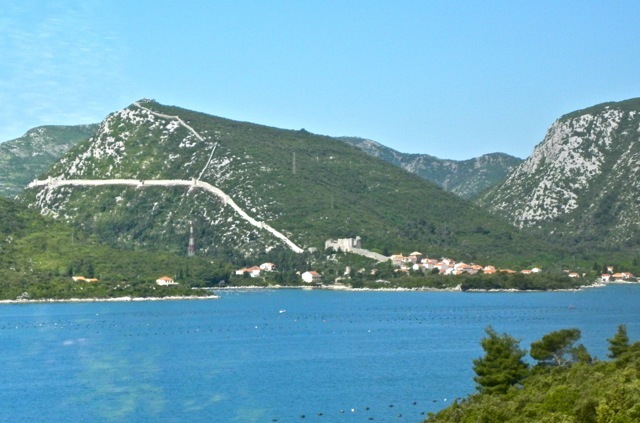 It is the 5-mile long wall that protected the city of Ston, and is called “European Wall of China”. Really. 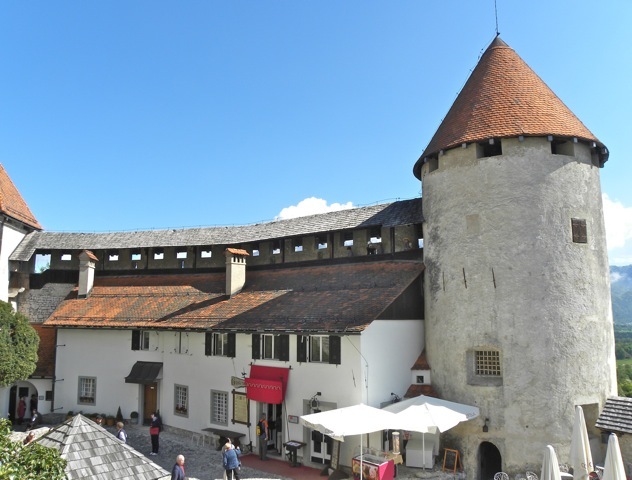 The last castle we visited on this tour was the Bled Castle in Slovenia. 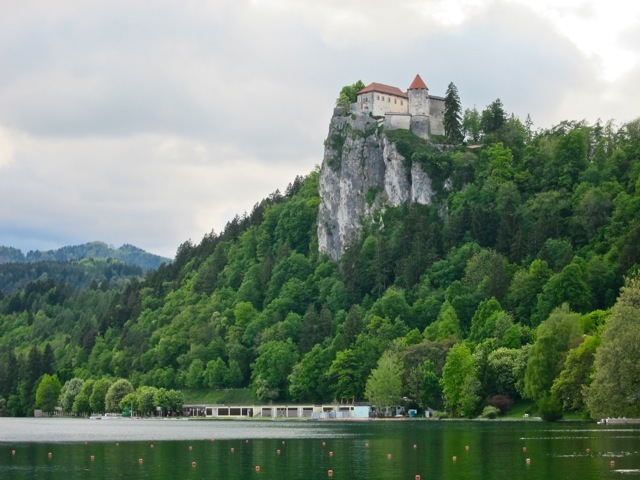 Sitting on a high rock outcrop above Lake Bled, this castle would be almost impregnable during medieval times. 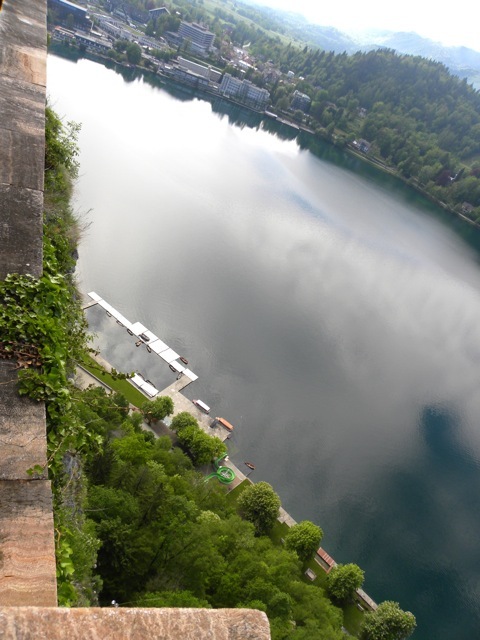 From the castle, looking down the vertical cliff at the lake below. 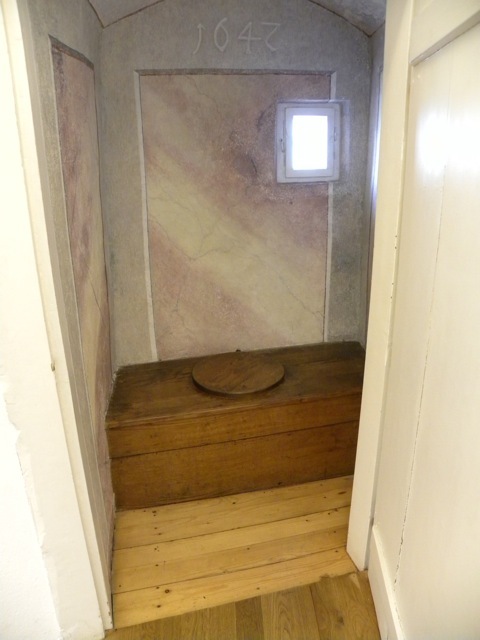 The lord’s residence has a toilet built in a shed hanging above the castle’s outer wall. The rampart and defensive tower of the castle. 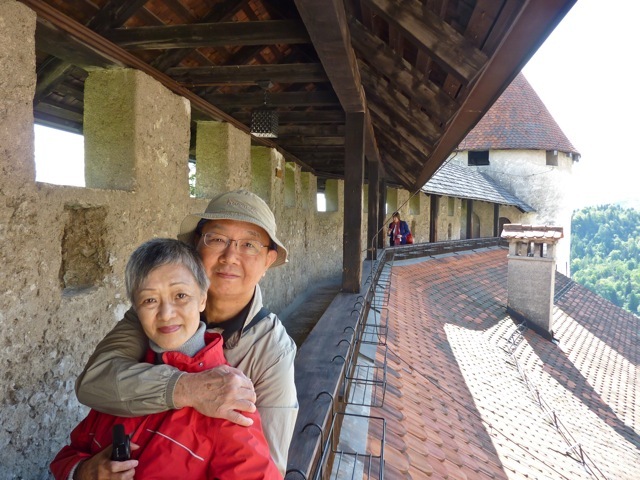 Sally and I posed for a picture on the rampart. Posted by Robert Wu on Wednesday, May 30, 2012, at 3:20 pm. Filed under Uncategorized. Follow any responses to this post with its comments RSS feed. You can post a comment or trackback from your blog.